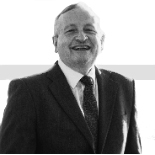 It gives me great pleasure to include something on my website that I wrote 31 years ago. It has re-surfaced on a great website called newhamstory.com and funnily enough I loved reading it again. There’s a little tinge of sadness as it also used to feature on the Newham Recorder website, until that was re-modelled about five years ago and many of the marvellous things on there concerning memories and history, and local news stories and features, were wiped off despite my comments as Editor that they were vital. A prime example was our Days of the Old School Yard feature, which I started 15 years ago, went on to one of the success stories of the website, the most viewed section. It had hundreds of great stories, but that was also ditched, with one comment from a company executive: “It’s our future that’s important, not our past,” given as a reason. That turned out to be, as many of the things that have since happened to the company, very sad, and a poor decision. There are now thousands of nostalgia papers, magazines and websites, along with many sub-groups on Facebook, Twitter and other social media. Our memories are what keep us alive, and sharing them is very much part of our history and community. I hope one day to redress the balance. Indeed, some of the old items which I was assured have been wiped, are still available in caches you get through the back door of the internet. Nothing is ever, truly deleted. Eighteen months on from being made redundant when my paper was merged with another title, I was very happy to find this little nugget. So, not quite as a I wrote the original, but remaining true to the person who re-created it and gave me a certain pride back again, is the story of the most amazing war wedding…. A Wedding That Captured The Nation’s Heart. It was a wedding that summed up the spirit of the Blitz. … and showed how even Hitler’s Luftwaffe could not disrupt the Cockney way of life. 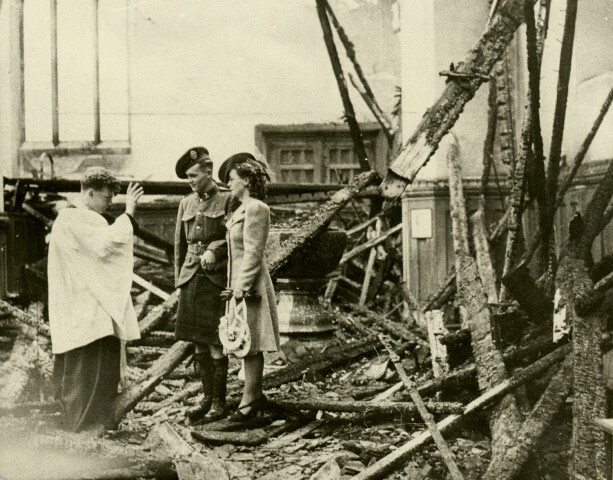 On 20th April, 1941, the morning after 150 incendiary bombs had gutted St. Bartholomew’s, East Ham a bride and groom arrived at the wrecked church. They found charred timbers and ravaged walls were all that was left of the church where they were to be married that day. But Helen Fowler, aged 20 of Caledon Road, East Ham and her Canadian soldier sweetheart, Cpl. 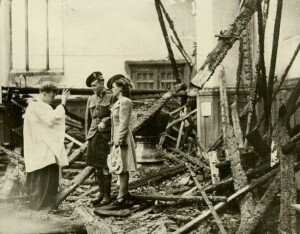 Christopher Morrison, aged 21 of the 48th Highlanders stood proudly amid the ruins of the bombed-out church and made their wedding vows, while fireman played their hoses on the wooden beams which were still smouldering. The Rev. Albon Rabson, the church curate, conducted the ceremony “with all the dignity of a normal occasion”, a church spokesman said at the time. The couple did not kneel because of the debris and a table was brought in for the marriage registers, relatives stood on the stone steps. The wedding of the corporal from the 48th Highlanders and the Dagenham Girl Piper made front page news in Britain and Canada. Local papers of the time were not allowed to reveal it was St. Bart’s that had been wrecked by fire until months afterwards. News blackouts were in force to keep information from the enemy, and in some cases the public. Helen, who joined the Dagenham girl Pipers at the age of 12, went with the Pipers, who accompanied the King and Queen when they visited Canada in 1939. In Toronto she met her husband-to-be. When she arrived home in England ten weeks after the war had been declared, Helen continued writing across the Atlantic and later, when Cpl. Morrison arrived in England with the Canadian forces they arranged to be married. When interviewed by Colin Grainger of the Newham Recorder in 1983 they said they remembered the day they wed as if it was yesterday. “He was nearly an hour-and-a-half late” said Helen. “Ah but I did have an excuse dear,” said Chris. “A few bombs had fallen the night before.” Chris was staying at a special serviceman’s hostel in the City and left with plenty of time to spare with his best man but Hitler’s bombers had severely hit London during the night. Finally one of Helen’s relatives stationed near the Town Hall saw the lads. And all was right. “I clearly remember the firemen playing their hoses on the burning wood. It was an incredible moment in our lives,” said Helen. They lived just a stone’s throw from where they were married in Greatfield Avenue, East Ham where they raised six children Lee, Christopher, Laurie, Stuart, Judith and Andrew. Chris, who won numerous rifle shooting awards was a member of the Queens 100 – the 100 best shots in the Commonwealth Empire. After he left the Army he did a variety of jobs including bus conductor, rigger, docker and Ford worker. Extracts from a special supplement of the Newham Recorder 21 April, 1983. This article was written on 22 Jul 2014, and is filed under Colin Grainger, community spirit, East Ham, East London, family life, History, Newham, The Blitz.